Who here remembers Kylesa? It has been a few years since they released an album, but for fans of the stoner/sludge/punk style, we have Leeds’ Black Moth more than ready to take over. Anatomical Venus is the band’s third album, and while the first two were solid slabs of psychedelic garage rock, they up the ante – and the heavy – on this release. The first word that comes to mind when opening track “Istra” hits us is massive. This song, and the album as a whole, blasts forth from the speakers with an aggressive abandon that’s wonderful to hear. Drums smashing, crunchy guitars blowing our hair back, and Harriet Hyde letting loose with a wonderful set of pipes. “Istra” is a fantastic start to the album, and it doesn’t let up from there. “Moonbow” features a complex riff, and “Sisters of the Stone” effectively melds influences such as Kyuss and The Stooges in tasty fashion, topped with some NWOBHM twin guitar harmonies. The addition of second guitarist Federica Gialanze, with her doom/thrash background, accentuates Jim Swainston’s already impressive riffery. The ten songs on Anatomical Venus never really let up, with riff after riff piling up on us and Hyde’s larger-than-life vocals drawing us into each cut. In the past she may have downplayed the fact that she’s a woman fronting a metal band, but on this album she revels in it, and it’s a compelling listen. Lyrics draw from the current climate of male-female dynamics: on the fast-paced “A Lover’s Hate” Hyde sings “I don’t know what’s wrong and what’s right, so I cry and I rage and I fight.” The raucous album closer “Pig Man,” featuring yet another excellent riff, summarizes the album’s theme nicely, railing against the objectification of women but not in a manner that will turn anyone off. 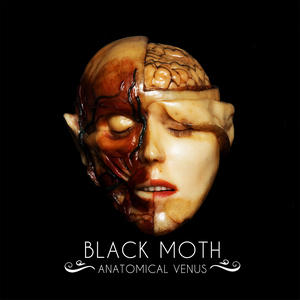 Anatomical Venus is a dense album packed with performances that makes us hit the repeat button. The riffs and leads are highlights, but they are overshadowed by Hyde’s performance, which is powerful, alluring and charismatic. All told, Black Moth have released their best album to date, one that will stay in my playlist beyond just listening for review purposes.